Established in In February 1937, against the backdrop of the Great Depression, Pepperdine University is a private, not-for-profit, coeducational research university affiliated with the Churches of Christ. The University is known for its picturesque location in Malibu, California and has had over 110,000 alumni’s in over 73 different degree programs. The Princeton Review has also recognized Pepperdine on its list of Green Colleges 500+ acres of the campus are preserved in a native state and 99% of on-campus irrigation is recycled water. The stunning 830-acre Malibu campus is located 35 miles northwest of Los Angeles with five graduate campuses spread across Southern California. Pepperdine also has six permanent international campuses, and additional study and internship programs on six continents. The first-floor windows at Pepperdine University were suffering from significant hard water damage, due in most part to a nearby sprinkler system which, over time, severely stained the glass. Another company had also tried to repair the glass and ended up chemically burning the surface, resulting in worse damage. The glass was set to be replaced until the benefits of a protective coating were discovered. After considering the various hydrophobic coatings on the market and the skill that would be needed to restore their windows, Kilroy Realty Group utilized DFI’s restoration and protection services. Through Diamon-Fusion’s patented nano-coating process, the chemical treatment creates a water-repellent effect, which enables ease of cleaning and protection against scratches, abrasion and other environmental elements. By first using DFI’s restoration products, the team successfully restored the glass back to a like-new appearance, then protected it from future harm by applying Diamon-Fusion glass treatment. The work was done without interrupting the tenants, being sensitive to hi-traffic business hours. By filling in the microscopic peaks and valleys of the exterior glazing, dirt, dust and other environmental contaminants cannot embed themselves in the glass, protecting it from future staining and etching. 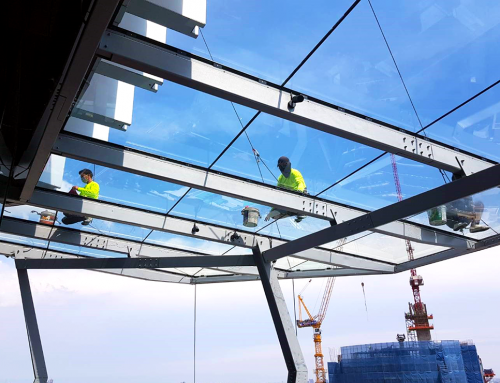 Diamon-Fusion is 100% optically clear, UV stable (won’t break down in sunlight) and prevents damaged glass from undergoing costly replacement projects which ultimately end up in landfills.